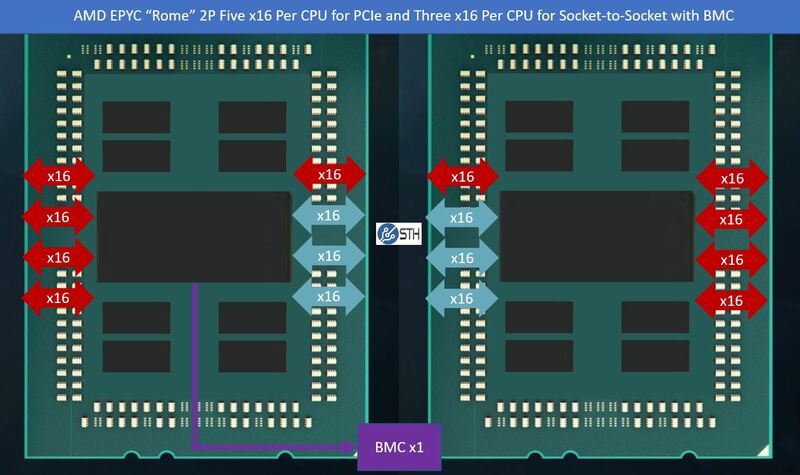 In this article, we are going to discuss why the AMD EPYC “Rome” generation will likely see 160x PCIe Gen4 lanes plus likely additional lane(s) for a necessary function. While all of our previous material focused on 128x PCIe lanes, in single and dual socket configurations for AMD EPYC, we are expecting a big change in 2019 with the new generations and one that Intel fully failed to address with its release this week. Intel instead focused on bringing out a large portfolio instead of addressing the fact that it is about to have a competitor with twice as many cores per socket and well over 3x the PCIe bandwidth in mainstream dual-socket systems. I was going through our original AMD EPYC and Intel Xeon Scalable Architecture Ultimate Deep Dive piece from 2017, and our team went through some of the technical documentation on AMD EPYC CPUs, and we found something. Over the past few weeks, we have managed to confirm with a number of AMD’s ecosystem partners that our theory is not only valid, but it is indeed what we will see. 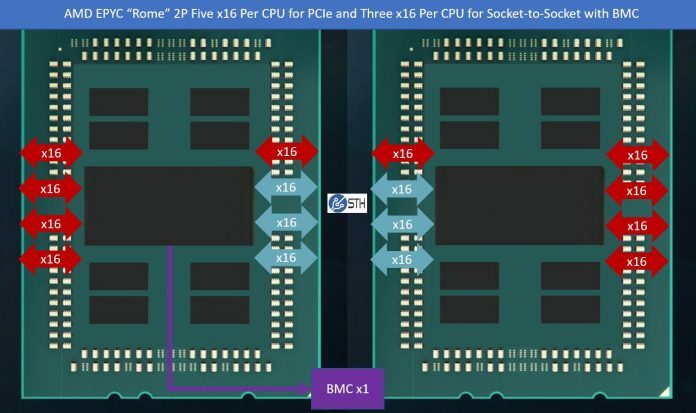 What we know to be true about AMD EPYC’s dual socket configuration is going to drastically change with Rome. In this article, we are going to show you why. On the first page, we are going to give you the background on the state of the server chip market today between Intel Xeon Scalable second generation lineups and the AMD EPYC first generation. On the second page, we are going to show you what will change to make AMD EPYC Rome and absolute monster for PCIe I/O. You can check out STH’s full 2nd Gen Intel Xeon Scalable Launch Details and Analysis including some benchmarks as well as our Second Generation Intel Xeon Scalable SKU List and Value Analysis to see how Intel changed its SKU stack to better align with competitive pressures from AMD EPYC 7001 “Naples” CPUs. 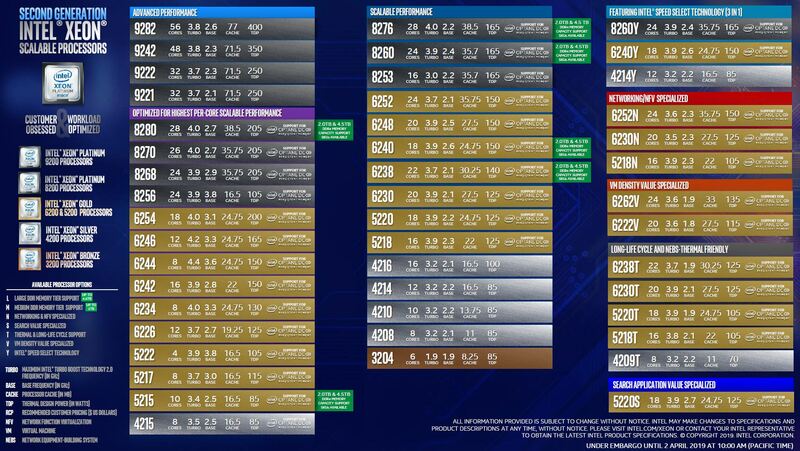 Intel still has a low power PCIe 3.0 x16 interface on the new second-generation chips, but it is limited to 48x PCIe lanes going directly from chip to device. The official Platinum 9200 series sleds top out at 80 PCIe Gen3 lanes in a dual socket system or less than we find on quad socket Xeon Scalable servers such as the Supermicro SYS-2049U-TR4 we just reviewed. At this point, it is completely appropriate to cry foul. All of these Intel Xeon Scalable Platforms have a Lewisburg PCH. We confirmed that Intel’s Platinum 9200 series platforms also had them. The Lewisburg PCH has additional PCIe lanes connected via a DMI x4 link back to the CPU. Higher-end Lewisburg PCH options with QuickAssist accelerators and additional networking need additional CPU PCIe lanes to be routed to the PCH. Still, the SATA, networking, and PCIe lanes of Lewisburg serve an important function, keeping lower-requirement I/O off of the valuable CPU PCIe lanes. Typically, AMD EPYC has struggled here, but it seems AMD may be fixing this on some Rome systems. We are going to get to that later in this article. The Intel Xeon Scalable 8-socket servers are very popular in China because the number 8 has special significance, as does having the largest server. That topology loses a direct connection between each of the CPUs, but it can potentially provide more PCIe bandwidth than we will see with AMD EPYC Rome generations. With the new 2nd Generation Intel Xeon Scalable CPUs covered, let us get to the current AMD EPYC 7001 “Naples” CPUs, and then to what is changing in Rome. To understand what changes with AMD EPYC “Rome” later this year, we need to start with the current “Naples” generation. The current generation managed to get a product shipped, but it did something more. 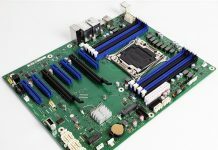 It set market expectations as well as the socket for a platform that will refresh to much higher capacity parts in 2019. With the AMD EPYC 7001 series, there are a total of eight x16 links per CPU. In a single socket AMD EPYC 7001 server, this gives us 128x PCIe Gen3 lanes. In a dual socket server, each die has a direct link to its sister die on the other socket. This uses one of the two x16 links running in Infinity Fabric mode. 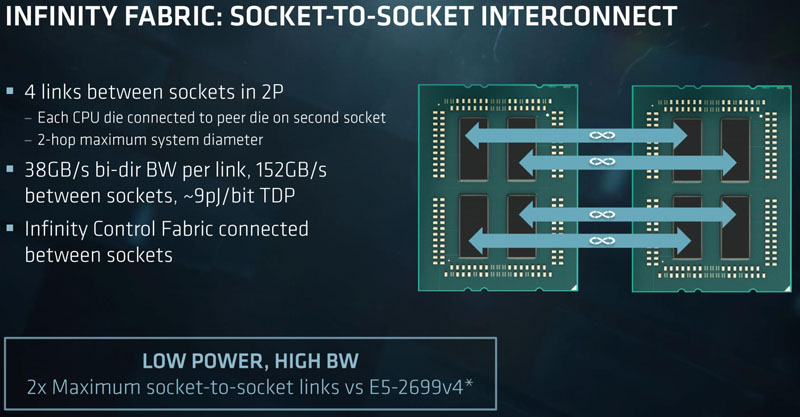 When I discuss the AMD EPYC 7001 series Infinity Fabric link between sockets, I usually tell people to conceptually think of it as a PCIe Gen3 x16 link between dies plus a little bit of extra juice. That is not entirely accurate, but most acquiesce that it is a decent rough conceptualization. The die marked with yellow has on-package Infinity Fabric links to each die marked with green. It traverses the slower and longer x16 Infinity Fabric link to the die marked in blue on the other socket. It has two-hop link options to each die marked in grey. Next we are going to show what we expect to change in the next generation, including what may be an awesome but underrated architectural improvement. So there’s fewer links dedicated to package-to-package communication that frees up some for PCIe. That’s great, but AMD made a huge deal about the “socket compatibility” of these new Epycs… aside from the fact that PCIe 4.0 ain’t going to work on an old motherboard without the repeater chips, an old motherboard also won’t rewire itself do deliver all these lanes. On top of that, how practical is it to be using all of these lanes in a real-world 1U or 2U server anyway? This is really smart by AMD’s engineers. I wouldn’t believe it otherwise, but this guy is the #1 server bro in the world right now. 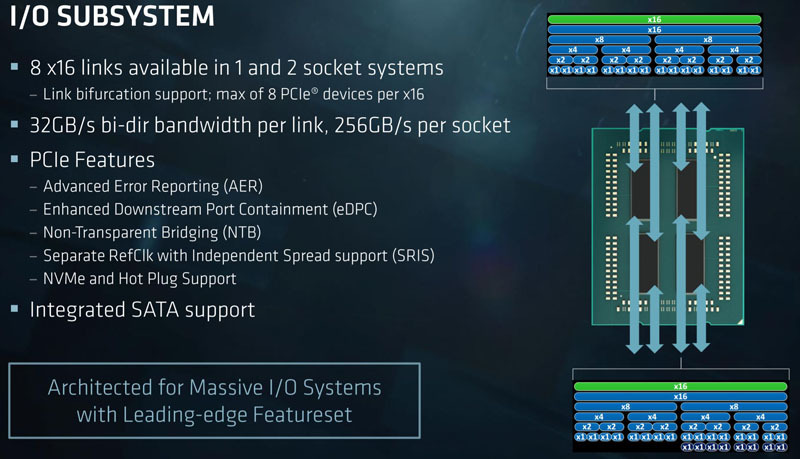 Regarding socket compatibility, are there extra pins on Epyc’s socket that were unused with Naples but would now be defined as PCIe contacts for Rome to enable this bonus PCIe lane? We buy servers fully integrated in racks, so this is far down the stack from what I’m usually dealing with. You’ve done a good job dumbing down the explanation so someone who doesn’t come from hardware engineering can understand what they’re doing. Jonathan they’ve even got GPIO from the SCH that they can use. As my kids say “yeet” AMD. Cascade’s been out hours and already looks like a dinosaur. Only one thing left to wonder about, how fast is the connection between the chiplets and the I/O die? 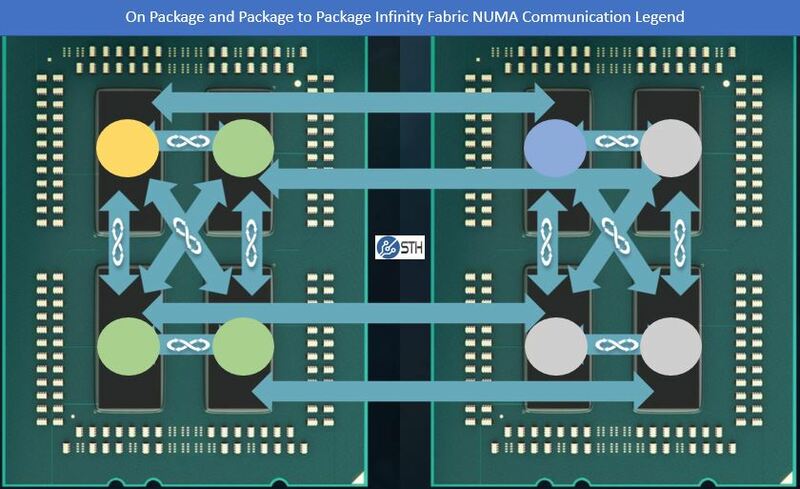 I think it’s a very clever design to get around the limitations posed by NUMA with first generation EPYC, it is somewhat ironic that Intel is moving in the opposite direction putting two separate dice into the high end Cascade Lake CPUs. I can’t help but question the utility of this cpu package interconnect. Amd can create as much bandwidth as they like between cpu packages but all that bandwidth is totally wasted with CPUs that clock at around 2.2 – 2.6GHz while Intel is already selling 3.8-4.0+ Xeons that run on such speed for dozens of cores. Either workload is CPU bound or it is not. When it is then CPU tacts matter and the interconnect bandwidth is not that important anymore. All AMD is doing is removing the past bottleneck but they still hugely under perform Xeons. I see zero applicability for HPC workloads. The only HPC benefit I can see is that you could now do 8 GPUs and 2 nics in a system at twice the bandwidth to the CPUs as Intel, and you don’t need pcie switches which the HPC codes don’t like. Honestly I never tire of touching myself because I’m such a fanboy. @Matthias Wolf: You realize that AMD can also sell lower core-count parts clocked higher if that’s what you want, right? AMD has had no problems hitting 3.5GHz on Zen so there’s no reason to expect they’d backpedal on that now. Re. HPC, IDK, I thought a big chunk of HPC cared about DRAM bandwidth; a bigger chunk than those that care about peak flops. 8-channels > 6-channels no? Yes, there’s cascade lake AP to post high scores on benchmarks, but that’s a completely new board. And HPC still connects I/O like Infiniband, Storage, no? 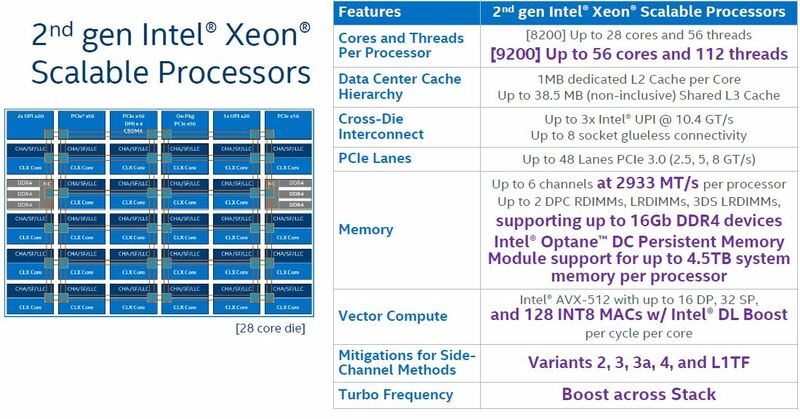 “but they still hugely under perform Xeons” In what? Linpack? Sure. Generally? Not “hugely” and this is speaking of Sky/Cascade vs Zen. Recall nobody without an NDA has seen Zen 2 yet. @Don Cornelius: AMD’s stated objective with Zen/Naples was to replace low/mid core-count 2P intel systems with a 1P naples. Hence the I/O. Apparently many folks bought 2P because 1P XCC was too expensive and didn’t have enough memory/I/O (so say AMD marketing, so pinch of salt and all that, but it sounds plausible). View it in the light of that fact. If the only reason you were 2P was to get gobs of I/O, you now have a solution in 1P. If you really needed lots of memory channels and memory in addition to lots of cores, 1P is probably not for you. You could extend the argument to 4P->2P consolidation although that’s a bit weaker. Also, compatibility generally means backward compatibility in this business. My understanding is that Rome plugged into an older board will default to PCIe-3 which satisfies that definition. It is not as if newer features cannot be introduced (AVX123, TSX, etc). @Matthias Wolf: While Intel is already hitting these high boost clock rates, they do so at the expense of a massive amount of power. Remember that Intel bases their TDP off of base clock, so with all cores running at 2.5GHz the 8180M uses 205W, once it boosts their TDP can easily double so that 205W becomes 410W. Now with the new 56C it has a 400W TDP which means while boosting each socket could pull 800W! Your 2 socket server with any cards/drives in it will need a 2000W PSU minimum. AMD does have their 16C high core clock Epyc and it looks excellent. I would assume they will do the same thing with the Epyc 2 line but perhaps have higher core variants. @Jeremy: The 8180 can sustain up to 3.2GHz on all 28 cores in some non-AVX workloads. But these are nowhere near 3.8-4.0GHz on dozens of cores that Matthias Wolf claims. Intel ups the 8280 all core turbo boost to 3.3GHz and the 4GHz turbo is only achieved on 2 cores. Amazing, Intel can keep selling products and even market new products that all have the “Spoiler” security hole with NO effective patch, and people keep enjoying paying more for “Spoiler Inside”! Hard times for intel and it’s followers. AMD document 54945 “PPR for AMD Family 17h Model 01h B1” lists WAFL PCS w/ x2 E12G PHY in chapter 1.7 Processor Overview. Did Naples already have these “WAFL Bonus PCIe Lane(s)”? @Jeremy,@Alex, all right not dozens but 18 cores (6154) and 12 cores (6146), at a top 3.7ghz and 4.2 ghrz respectively. Multiply cores by 2 as those are being deployed on dual socket boards and you get your dozens. Amd only countered in November last year and even that epic chip performed poorly (7371) vs my other 6146 and 6154 Intel chips in most math computations. There is a reason that as of today hardly any hpc or gpu compute vendor utilizes epyc chips despite their high pcie lane count. 2) No downclocking, as on Intel CPUs, when AVX is fully activated. This article has good info, but could have been written in 2 paragraphs. Making an article unnecessarily long is wasting readers’ time. Less is more. “Memory speed and bandwidth is almost always of lesser priority than cpu tact frequencies in hpc space” Really?Take a look at this: https://arxiv.org/abs/1810.09330 “Double-precision FPUs in High-Performance Computing: an Embarrassment of Riches?” They conclude that 60-70% of HPC loads they run (RIKEN) are memory bound. I’ve also read someone from Berkeley complain about modern CPUs being optimized for cloud/enterprise vs. HPC on the memory side but I can’t find a citation now. It may well be that what you do fits well in the caches (DGEMM etc) but it’s a huge generalization from one datapoint. Also, HPC != Deep learning. There’s some overlap but in my view, HPC is Double Precision stuff. Moreover, you’re complaining about an unreleased product stack. Unless you can get >50% utilization of FP 512 units, you are not going to be much better than AVX-256 (full width) for a given application. There are loads that can do this (*GEMM, Linpack, etc) but it’s hardly the norm. This is also why AMD is able to keep up with Xeon in SpecFP; spec FP is mostly memory bound. FP 512 is great to post linpack scores on Top500. And there certainly will be loads that vectorize well and fit in the caches. To me, AVX-512 seems an attempt to keep nVidia out of the datacenter. As to who in HPC has signed up for rome, take a look at this: https://www.hpcwire.com/2018/10/30/cray-unveils-shasta-lands-nersc-9-contract/ And they’re not the only one. L. P., I never claimed that nobody finds utility in this chip for HPC. I made a generalized statement. Your link provides no details how those nodes that will run on Rome CPUs is utilized. I can assure you that that not a single machine that makes use of cpu bound traffic in high frequency trading, a show case of hpc, where latencies and high throughout really matter, utilizes Epyc chips. I know of not a single one and consider myself relatively informed in this space. Are there use cases for epyc chips? For sure. But as I said, it depends specifically which workloads. Even a super computer cluster has various workloads and for some of it fpga cards make the most sense, for others high performant CPUs and for again others you want Chips with lots of pcie lanes. The article you quoted does not go into any detail on the precise use case where the Rome chips are supposed to be utilized. @deltaFx2, I am not judging from just one data point. I am pretty well connected in the high frequency trading space where there are either fpga or cpu bound workloads involved and where nobody cares about AMD (so far) because they have no product that remotely competes with Intel or fits minimum requirements. There are now a few epyc based gpu servers out there but the large majority runs on E5 v4 machines or Xeon scalable chips. Does that constitute the entire hpc space? Certainly not, but it represents typical use cases in hpc space. Furthermore, I have the Xeon Gold 6154 and Gold 6146 and both outperform the Epyc 7371 in various applications that involve cpu compute without any specialized optimizations on the software side for the Intel CPUs. I can’t speak for Rome as they are not out yet but I am prepared to be disappointed. Again, I am working in a nich area and can’t speak for the utility of those chips in network, web, or storage related applications. I welcome competition and hope amd eventually gets its act together. But I find the amd hype by fan boys completely over the top. Many even claim how Amd is gonna heavily eat into Nvidia’s market share in gpu space. Those are dreams and wishes but none of that is validated by trends or statistics. Equally in gpu space, AMD does not have competing products that come close in performance to what Nvidia offers in the top segment. Not even remotely close. EPYC Rome has 4x the AVX performance compared to EPYC Naples, EPYC Rome has twice the L3-cache compared to EPYC Naples. Xeon Gold 6154 cost $3500, Xeon Gold cost 6146 cost $3300 where EPYC 7371 only cost $1700. @Micha, it’s interesting that you are one of the first who mentions price because surely this category is a clear AMD win. No disagreement here. Am quite curious about the Rome AVX performance because many of my cpu bound apps peruse avx. The only way to find out is to try out. Marketing gibberish got me into the early threadripper gen1 then gen2 then epyc gen1 and all disappointed big time. I only speak for the applications that I used to benchmark performance,among many others, C++ compiled code (I used ICC but also other non Intel ones). Would it be possible for AMD to tap those extra PCIe lanes into more sockets? 4p or 8p? @Matthias: “Does that constitute the entire hpc space? Certainly not, but it represents typical use cases in hpc space.” Now here’s where we fundamentally disagree. You’re probably the first person I’ve come across who classifies high frequency trading as HPC. It’s an interesting argument, but HPC to me means large clusters often running MPI, solving large-scale science problems (CFD, particle physics, molecular biology, that sort of thing). And I do think trading workloads does not represent HPC workloads; trading workloads are strongly incentivised to shave off the last microsecond, something HPC does not have as strong an incentive for. My original point stands: you said “I see zero applicability for HPC workloads.” You meant “I see zero applicability for high frequency trading”. You may well be right, but you are extrapolating from one highly biased sample (I’ll grant it’s not one datapoint but several similar ones). It may also be that your application is highly tuned over the years for intel’s cache hierarchy (and it’s totally reasonable to go with intel at that point). I don’t know or care about market shares in gpu/cpu. I just found your original claim of zero applicability very strong. @Matthias You do realize that your purported conclusion is actually contradicted by your cited reference? The logic behind the article is big data and hpc influencing high frequency trading. Not the other way around. The article furthermore treats all three areas as separate entities hence leading your conclusion ad absurdum. @L.P., AMD itself promotes the Epyc 7371 as Chip useful for high frequency trading applications 🙂 AMD itself said it. And AMD sales was quoted in interviews with Anand tech. Anyone working in this space acknowledges that gpu compute and hft are both part of hpc. I pointed to the sources, feel free to look it up. And if you still disagree then, we’ll, let’s agree to disagree. I own several Xeon gold and the epyc 7371 and have run performance benchmarks. Have you? I also work in hft space and spend many hours each day on deep learning networks. I acknowledged the areas I have zero expertise in, but claim to know a thing or two about what I have been doing over the past 11 years. If Rome will solve your problem then by all means go for it. I am absolutely convinced it will not be widely accepted in hpc space.